The shoulder seasons (early spring, mid to late fall) are excellent times for visiting Yosemite National Park. 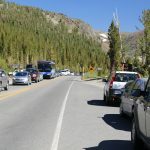 The weather is a bit cooler than the heat of the summer (nights are chilly but days warm up nicely) and you are sure to miss the masses of crowds that converge on the valley floor during the mid summer. Not to be outdone is the winter season – Badger Pass Ski Area with its set of lifts, runs and an excellent ski school is found within the park’s borders. Cross country ski trails abound. There is a quieting you can feel on the valley floor after the season’s first snowfall when everything is white; nothing could be better at this time of year than sitting around the roaring fire in the historical Ahwahnee Lodge’s grand reading room. 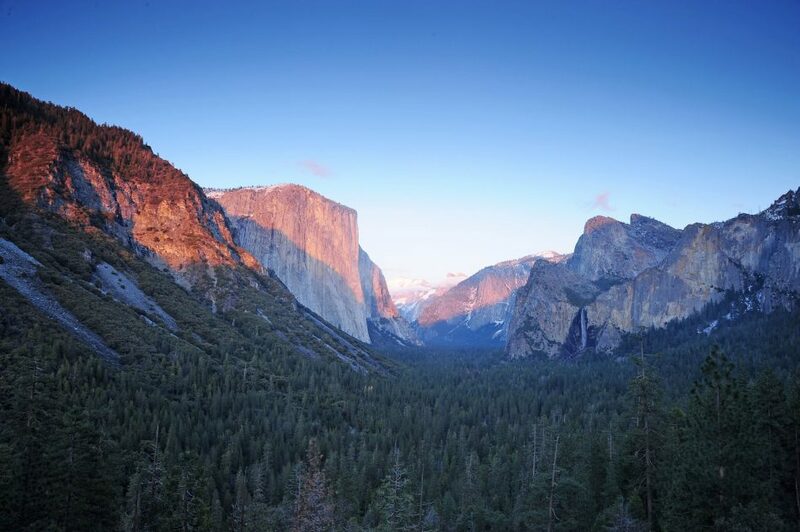 Yosemite is one of the most visited of all the National Parks…for good reason. With its stunning vistas and overlooks, major waterfalls, impressive granite domes and monoliths, giant Sequoia trees, abundance of hiking and excellent trails its no wonder that people come from all over the world to visit. If there is only one place you visit in the Sierra’s during your time in California, a good choice would be Yosemite National Park. 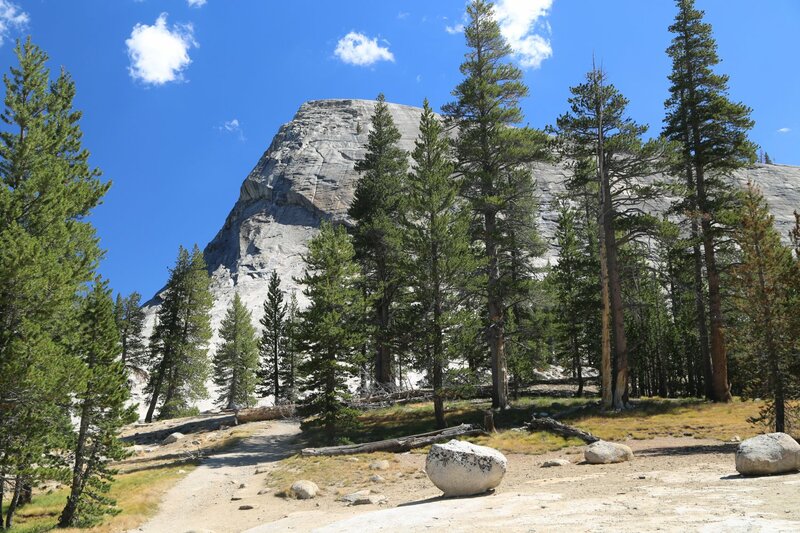 However avoid visiting Yosemite National Park on the weekends in the summer. 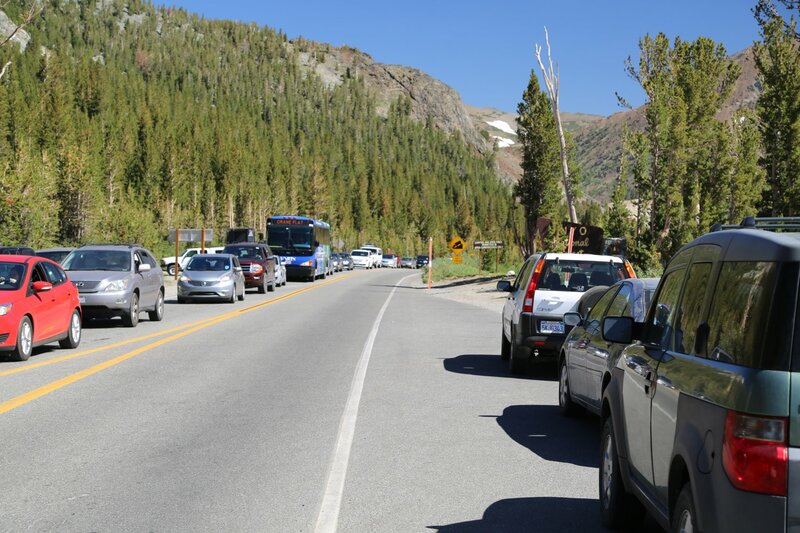 Visitors often experience extremely long lines stuck in traffic backed up to get into the park entrances. 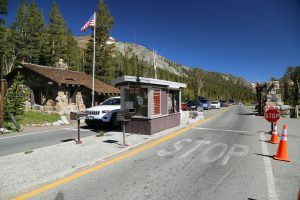 And on the valley floor, traffic can be a nightmare – with long waits getting into some of the park’s most iconic viewpoints and natural attractions. Yosemite National Park is contained within parts of three counties; the valley floor is entirely within Mariposa County. 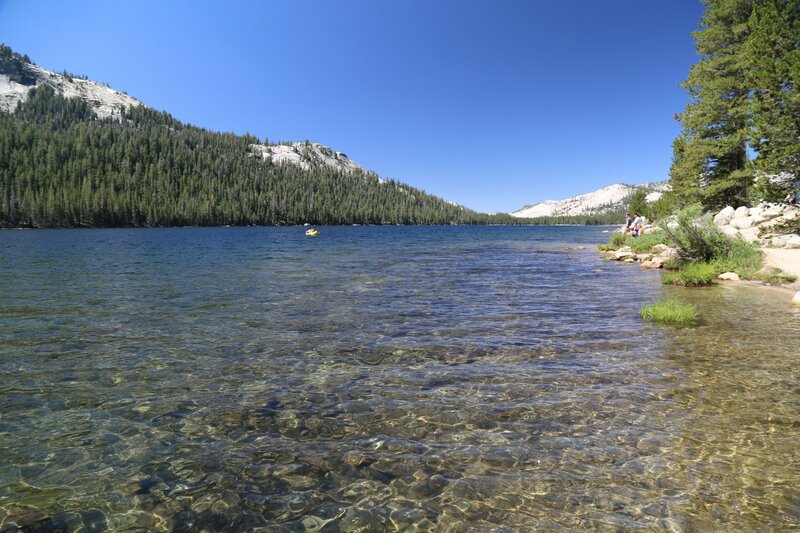 Mariposa and Yosemite are truly four season destinations with an amazing variety of activities year round to please even the most selective of travelers. Mariposa means Butterfly in Spanish and was originally California’s 2nd county and the largest county until it was sub-divided into much smaller counties. 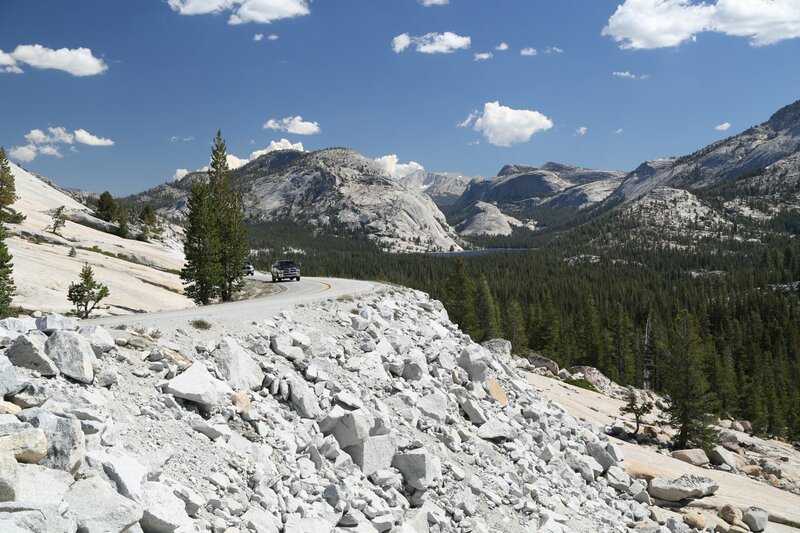 Mariposa County and Yosemite are very centrally located within California. 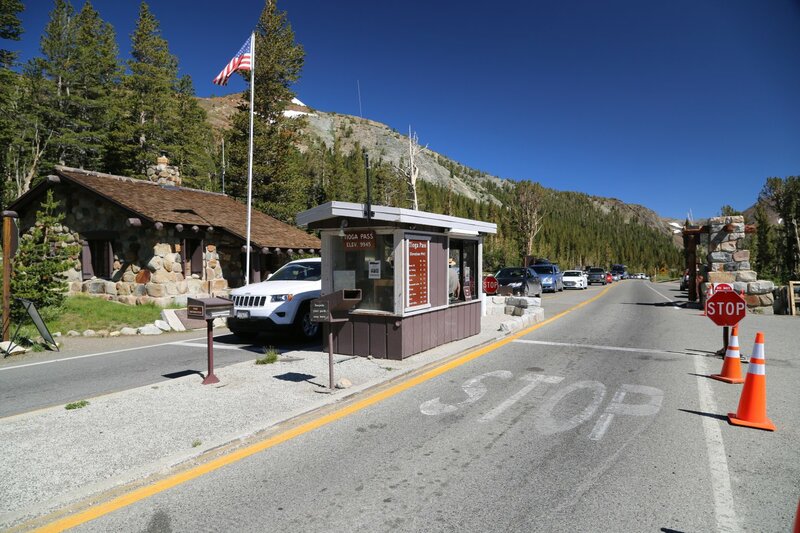 The National Park lies almost at the geographic center of California and all weather highways make access to the park relatively easy year round from the major population centers in the state. 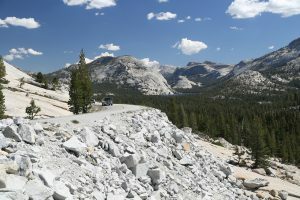 Tioga Pass is the park’s primary access to the east. However this road is usually closed from November to June (the opening and closing date varies based on the severity of each particular winter). Read on for more information about activities, attractions and lodging. Nicole – yea this year I think there is less snow and the Tioga Pass will open before June 1, Glacier Point, Saddlebag Lake, Tuolomne Meadows – very very beautiful areas. I also love Sequoia. 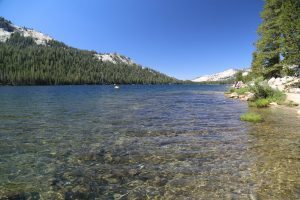 A great backpackers circuit is the Rae Lakes Loop. Yosemite is truly spectacular, a lot of times we forget the treasures in our own back yards. See it when you get the chance. That is correct Virgil! Can’t wait to get back up there – we have a friend visiting from out of country in 2 weeks so we are thinking of visiting Yosemite again and showing her inspiring natural place. Weather should just be about perfect at the end of May – warming up nicely. My parents took my brother and I to Yosemite many years ago and even as a child I remember just being in awe of the natural beauty of the place. I would love to visit again now that I am grown and can see the reactions of my own kids. Debra – I need to get back up there – it is truly an awe inspiring place! I love Yosemite. Thank you for your post. I gain a lot of information from your post.